Among their objectives for the 6 week summer Grow Detroit’s Young Talent training and employment program is to “ensure that young adults have meaningful summer work experiences that create pathways to future opportunities” and to “connect young adults to professional networks and employers that can support their career goals.” Dehvin, Ebony, KeAndra, Rashid, and Micah, five young adults from this city-run program spent 6 weeks working with Grandmont Rosedale residents, business owners, and GRDC employees and board members and they more than fulfilled the objective! The youth worked on beautification efforts at the Grandmont Rosedale Community Garden, the Stahelin Project, CornerView Park, along Grand River, at the North Rosedale Park Community House. 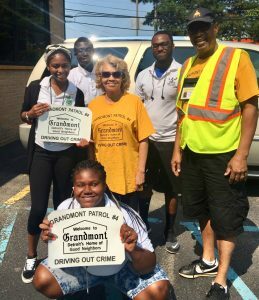 The youth helped out at the Northwest Detroit Farmers’ Market, attended Crime Prevention Task Force meetings and Vacant Property Task Force meetings, and rode along with veteran Radio Patrol volunteers. Perhaps most importantly, the youth got to know several Grandmont Rosedale residents and learned how community is created. GRDC board member and Grandmont Rosedale resident Walter Edwards worked with the youth beautifying the Community House grounds. He also quizzed them on state capitals and played goalie in a quick game of soccer. GRDC’s Community Engagement Manager Kitty Yarbrough brought the youth to Crime Prevention Task Force Meetings and Vacant Property Task Force Meetings to show them how the Grandmont Rosedale community comes together to work on some of our greatest challenges. Several Grandmont Rosedale residents bought the youth lunch after a day of hard work in the hot sun. The Grow Detroit’s Young Talent program benefitted the youth as well as the entire Grandmont Rosedale community. While the youth had very specific and often school-related plans for the money they earned, they also finished the summer with a greater sense of how community is created and maintained. Dehvin a Cody Rouge resident, whose future plans include medical school, said that he had “no idea that there were so many people who cared so much about their neighborhood.” The youngest of the group and certainly the most enthusiastic gardener, KeAndra now notices “weeds and trash. I never really noticed that before.” Michigan State University student Rashid was impressed “by the overwhelming hospitality of the residents in Grandmont Rosedale. To be a part of beautification with different residents made me feel good.” People are the most important part of any community, and the residents of Grandmont Rosedale did their community proud in welcoming, including, and giving the young people of Grow Detroit’s Young Talent Program a memorable, challenging, and even fun experience. To learn more about the Grow Detroit’s Young Talent Program, visit their website at http://gdyt.org/, like Grow Detroit’s Young Talent on Facebook, or follow them on Instagram.